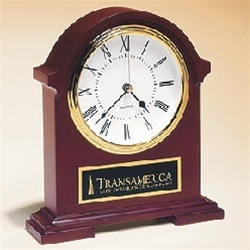 7 1/2" x 8 1/2" x 2", Engraved Mahogany Mantel Clock with black plate which engraves brass. Price includes engraving. We will email you a layout of the engraving for approval before proceeding.